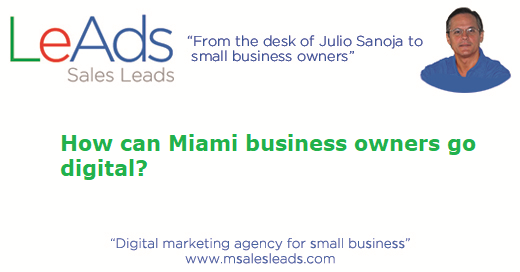 How can Miami business owners go digital? Have a business page at major social networks: LinkedIn, SlideShare, Facebook, Instagram, Twitter, Google Plus. Be listed at major online local and national business Directories. Have NAP consistency. Your business Name, business Address, and business Phone must be the same at all your digital media and directory listings. Comply with all the Google website performance tests. Have an email marketing platform at MailChimp. Produce, publish, and distribute in all social media and email marketing a daily article, note or post about your products, services, brands, and how they satisfy your prospects and customer needs. Have an advertising campaign in place, dependign upon your audience, either in Google, Facebook, LinkedIn, Amazon. This article was written by Julio R. Sanoja, owner and founder at MSalesLeads, a digital marketing agency for small and mid-size businesses. We help small and mid-size businesses to go and grow their businesses online; position their brands, products and services online; get qualified leads and new customers online. 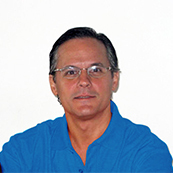 Julio has been a digital marketing consultant for the last 16 years.